We’d love your help. 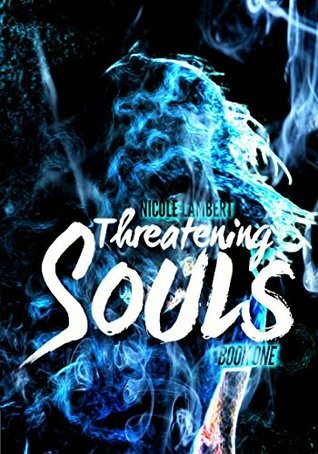 Let us know what’s wrong with this preview of Threatening Souls by Nicole Lambert. The sacrifices, the drama, the horror within. In the year of 1860, a curse was performed over the suburb of Roseway, Washington, which rests about twenty miles south of Seattle, that killed nearly every living resident. After coming back to Earth as spirits, they form a twisted plan that not only provides them with bodies of their own but also kills off all who venture int The sacrifices, the drama, the horror within. In the year of 1860, a curse was performed over the suburb of Roseway, Washington, which rests about twenty miles south of Seattle, that killed nearly every living resident. After coming back to Earth as spirits, they form a twisted plan that not only provides them with bodies of their own but also kills off all who venture into Roseway in the future. Thirteen-year-old Rebekah Jensen has lived a fine life in Marywood, Florida with two best friends, a clique that strives to make her one of them, and a boyfriend who happened to be one of the most popular guys in her school. But all that is about to change when the date of her arrival to Roseway nears, when she starts to see things that she presumes are spirits—and she is sure that she had gone insane. After moving to Roseway, she gets sucked into an illusion of the dead, coming to regard Roseway as some sort of cult in which they worship a mysterious being that is introduced to her as the Master. Within the months of enduring Roseway, she finds out more about herself and her purpose in the suburb. Teaming up with a friend, who has a dark secret, Rebekah must put an end to the curse before she ends up like the rest of the victims. To ask other readers questions about Threatening Souls, please sign up. I heard this book was free on Amazon for a short period of time so I downloaded it, because I have been wanting to read it for a while now. While I wasn't crazy about the cover, I fell in love with the intensity of the plot! I have had to force myself to put it down and not set and read all In one go. I loved that the story was unique and the development of the main character, Rebekah was outstanding! Just the overall way the way it was written was impeccable. I loved how each character was very I heard this book was free on Amazon for a short period of time so I downloaded it, because I have been wanting to read it for a while now. While I wasn't crazy about the cover, I fell in love with the intensity of the plot! I have had to force myself to put it down and not set and read all In one go. I loved that the story was unique and the development of the main character, Rebekah was outstanding! Just the overall way the way it was written was impeccable. I loved how each character was very much their own person and each had their own quirks. The way Roseway was created was done perfectly... for a fictional town it seemed so real. I honestly had no idea that this book would be so suspenseful that made me want more. I cannot wait to read the next book! I was sent this copy by the all amazing Melissa who is the creator behind The Polyethnic Publishing, and honestly from the moment I heard about this book I was super excited to read it and so the second this book came into my possession I could not put it down. The characters developed so organically and the relationships that Rebekah formed once she finally went to Roseway felt in no way pushed. If anything the characters made the plot happen and helped push along all of the unexplained and keep you reading. One of my favorite parts about the characters was all of the mystery and intrigue that went behind the walls of Roseway. The whole time it had you questioning about who was who and who were these spirits. Then there was the whole plot about this cult like area which, Roseway, and I found that to be my favorite part. Not only was it super odd and mysterious but the town itself had a way to draw you in and make you question their motives. The plot surrounds Rebekah’s main reason for being drawn into Roseway and it was fascinating. I don’t really want to spoil that for you but trust me it’s really weird and interesting. The entire time I was reading I kept wanting to know more and more about what was going to happen and honestly could barely put this book down. The third person narrative only furthered my need to finish the book and made connecting to all of the characters that much easier. I loved that Lambert had random POV switches that gave so much development and insight into each person. I really loved that the plot and storyline all felt new. This was truly unlike any other book I’ve read before and I enjoyed it that much more. This book combines so many different elements and did it seamlessly. Overall the mystery behind Roseway drew me in but the writing style and organic story kept me reading. I loved the idea behind this book, and enjoyed reading it. It was a different genre than I usually read, but sometimes that's good. I could definitely read this again. I have to admit, I was a bit apprehensive when I chose this book for my next review. The author had warned me that is might be a little dark, and that it dealt with topics that can be uncomfortable. It had also first been written when the author was between twelve- and thirteen-years-old, so I was expecting the storyline might be a bit immature. I had a sneaky suspicion that I might not be giving it too many stars. I was wrong. The story was compelling, all the way through, and this is a bit of a I have to admit, I was a bit apprehensive when I chose this book for my next review. The author had warned me that is might be a little dark, and that it dealt with topics that can be uncomfortable. It had also first been written when the author was between twelve- and thirteen-years-old, so I was expecting the storyline might be a bit immature. I had a sneaky suspicion that I might not be giving it too many stars. I was wrong. The story was compelling, all the way through, and this is a bit of a lengthy read at just over 400 pages. It held my interest far more than I initially expected, and I truly found myself enjoying every moment of this read. And, yes, there were several parts where I had to suspend disbelief, and some parts where the characters acted in such a way that I couldn’t see it happening as the author wrote it if this had taken place outside of a fantasy environment; such as when thirteen-year-old characters suddenly take themselves out of school and fly from one side of the United States to the other, with no plans on when they might return. They are able to purchase airline tickets, make it through security, and their parents never enter the story wondering where their kids might have wandered off to, even though they’ve been gone for several months. And there is an almost constant introduction of new characters, all of whom seem to be aware of what’s going on in this world of witches, magic, and people whose bodies have been possessed by the spirits of the long-since-dead residents of Roseway, a small suburb outside of Seattle. But that’s part of what makes this story such a good read! The entire story reads like one of those teen/young adult fantasy-adventure television shows. Though, as the author warned me, there are some darker parts, and the amount of times large quantities of blood are mentioned in the story is fairly often, it really isn’t that dark. Gory, gruesome, unpleasant at times, sure. But there was nothing alarming or disturbing. Yes, there were mentions of abuse, both physical and sexual, but those were mostly passing references and not described in shocking detail. Trust me, I’ve read books that provided such graphic descriptions of these types of events that I couldn’t continue reading. This book goes nowhere near that level. I think the part that I loved most is how the author always came up with clever ways to keep the story moving forward at every part where it felt like it was about to reach a climax, or where a less creative story may have become stalled or dry. Lambert truly has a gift of creating genuinely enjoyable plot twists, and I found myself smiling with enjoyment when the story took yet another turn. And to have done this at the age Lambert was when she wrote the book made it all that much better. Disclaimer: None. I bought my own book yo! Synopsis: The sacrifices, the drama, the horror within. In the year of 1860, a curse was performed over the suburb of Roseway, Washington, which rests about twenty miles south of Seattle, that killed nearly every living resident. After coming back to Earth as spirits, they form a twisted plan that not only provides them wi Disclaimer: None. I bought my own book yo! I like a good dark book and for the most part I really enjoyed this book. I felt the story was engaging and the characters were very interesting. The book is well written and it’s the perfect book for a spooky Halloween. However, I do have some qualms about the book (as I always do about every book… hey no book is perfect!). I feel that the book’s plot is a bit muddled and the pacing is really slow for this type of book. I also felt that the world building could have been better. Overall though I really enjoyed the book. Verdict: If you’re looking for a spooky read, this is it! This book kept me on the edge of my seat the entire time! I LOVED IT! Threatening Souls by Nicole Lambert is a must read for thriller/horror/drama fans! I'm normally not big on thrillers, but I thoroughly enjoyed this book from beginning to end. The characters were relate-able and interesting, which added to the fact that the story was fluid and entertaining. Each chapter left me wondering what was going to happen next, which made a 400+ page book feel like it was over too fast. It left me wanting more! Luckily, Bleeding Misery(the second book in the series) is ou Threatening Souls by Nicole Lambert is a must read for thriller/horror/drama fans! I'm normally not big on thrillers, but I thoroughly enjoyed this book from beginning to end. The characters were relate-able and interesting, which added to the fact that the story was fluid and entertaining. Each chapter left me wondering what was going to happen next, which made a 400+ page book feel like it was over too fast. It left me wanting more! Luckily, Bleeding Misery(the second book in the series) is out already so I will definitely be checking that out next. At times the story's setting and the overall threat of the antagonist reminded me of Buffy: The Vampire Slayer, while the story itself is akin to that of Lev Grossman's The Magicians series. Two of my favorite series in media! N. M. Lambert is the author of the Threatening Souls series, the Days of Darkness series, and The Five Stages. When she isn’t writing, she enjoys music, such as singing and listening to her favorite bands, gaming, reading, and hanging out with her friends and family. She currently fluctuates between Cave Creek, Arizona and Flagstaff, Arizona, since she is studying criminology, anthropology, French N. M. Lambert is the author of the Threatening Souls series, the Days of Darkness series, and The Five Stages. When she isn’t writing, she enjoys music, such as singing and listening to her favorite bands, gaming, reading, and hanging out with her friends and family. She currently fluctuates between Cave Creek, Arizona and Flagstaff, Arizona, since she is studying criminology, anthropology, French, and psychology at Northern Arizona University. Her family consists of her dad, mom, brother, and a menagerie of dogs, cats, birds, fish, and a lizard. At eight years old, N. M. Lambert began her writing career with a story she wrote for school about four orphaned puppies that undergo unfortunate circumstances. Since then, she has slowly progressed from short stories to novels, completing the first draft of her young adult dark fantasy novel, Threatening Souls, at age thirteen. It wasn’t until a year later when she began to frequent social writing websites, first starting with Inkpop before it merged with Figment and then later joining Wattpad. It was on Figment when she took an active interest in reviewing and critiquing other’s works, which then branched over to editing. At age seventeen, she rewrote her debut novel, Threatening Souls, and self-published it in October 2014. Since then, she had signed with The Polyethnic Publishing in early 2016 to republish her debut novel two years after its original publication.